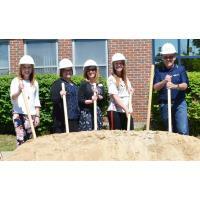 ROCHESTER, NH – It’s been twelve years since HRCU opened a branch at Spaulding High School, part of the R.W. Creteau Technology Center. The unique partnership between HRCU and Spaulding High School gives students real-world, hands-on training as they learn how to work within a financial institution. Students in the Banking & Financial Support Services program learn about the many aspects of financial support services and receive an HRCU Teller Certificate upon completion. Topics include compliance, fraud, lending, money management, investments, insurances and overall career readiness skills. Numerous students have been hired to work for HRCU after completing the program. “Providing this program that helps students develop personal financial knowledge, combined with career experience, is an excellent example of how Career & Technical Education (CTE) programs prepare our students to be successful, working adults,” said Leah Taylor, Director of Youth Financial Education. Since 2006, the program has evolved and changed to keep up with the many needs of the financial service industry and to help improve the overall student experience. One exciting change is that students are now eligible to receive college credits for taking the course through Great Bay Community College’s (GBCC) Running Start Program. Students that take advantage of this opportunity will earn three (3) college credits for a Personal Finance course at GBCC. Another change to the program is the addition of an “exploratory course”, which is a quarter-long class allowing students the opportunity to explore content that would typically be taught in the yearlong Banking & Financial Support Services program. This new course is aimed at helping students build the knowledge required to make intelligent financial decisions for their future using Junior Achievement (JA) curriculum. Students will learn about budgeting, saving, credit, debt and will get a chance to make real-life financial decisions in the JA Finance Park virtual online simulation. The HRCU branch is now part of the renovation at the R.W. Creteau Regional Technology Center. The HRCU SHS branch is currently located at the back of the Tech Center but will be moving to the front upon renovation completion. The branch and the classroom will be completely renovated and updated. The branch will obtain new technology to be consistent with other HRCU branches and better prepare students for career success. Plans will also be for more public access including a 24-hour ATM.